I complain about having to deal with a whole new database but I get to do my work in a toasty warm office, in a comfy chair. 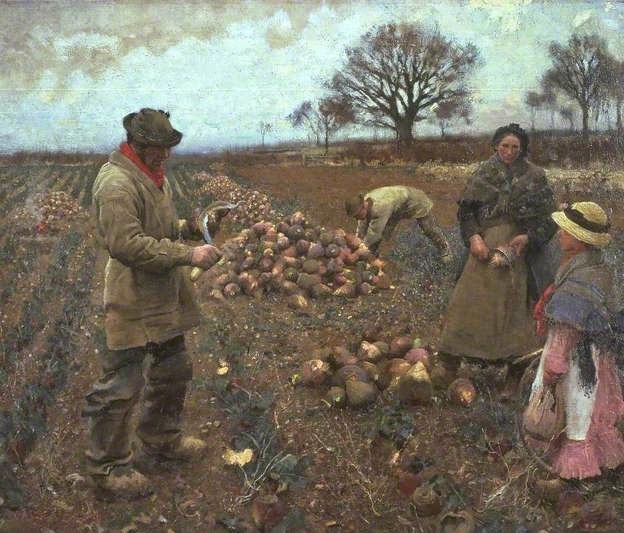 This family are out in a field, harvesting turnips (I assume, but it would be easier to refer to them as the vegetable of unbearable bleakness). Everything is muddy, cold and difficult, the mud clagging the boots of the father, drawing him into the earth which makes his living. The mother just looks miserable, and she appears to be looking at her daughter. The daughter is an interesting figure; she's the smallest and the youngest, and her clothes are quite pretty in comparison to the rest of her family. I think she has a hoop and stick in her hand and has been off playing, maybe at school. She has a muddy field to look forward to. Maybe that is what the mother is thinking - she was once a little girl with a hoop who thought her life would be more fun than mud and turnips. Yikes. Happy Christmas. Clausen is a smashing artist whose work is simply beautiful. Born in 1852, his work spanned well into the twentieth century and included time as a war artist in the First World War. His work always reminds me of the work of French artists and he spent some time studying in Paris where he saw the Impressionists. He became a foremost painter of peasant and landscapes, using light as his subject, but his work has more clarity than his Impressionist inspiration. He was knighted in 1927 and lived through to the Second World War, dying in 1944. Whose boughs are bent with thickset fruit. The poem is about the narrator's joy on the arrival of her love, that she is born on that day, that very splendid day, because it's the day she has him. Unlike many, if not most, of Rossetti's poems, the tone of the piece is so happy, so overwhelmed with utter bliss, just because the object of her love exists. I can think of no more romantic thing to give to the love of your life than a bracelet that has that sentiment written upon it. 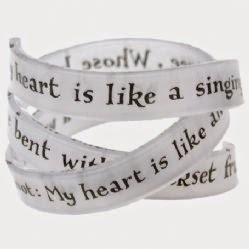 To buy the bangle, look here. Clausen sounds awfully Danish to me. Sure enough in the census returns he is shown as born in Denmark. Clausen père anglicized his name to George presumably from Jørgen and via Jurgen (as in the marriage register). It is apparent from the 1901 census that he retained his Danish citizenship. 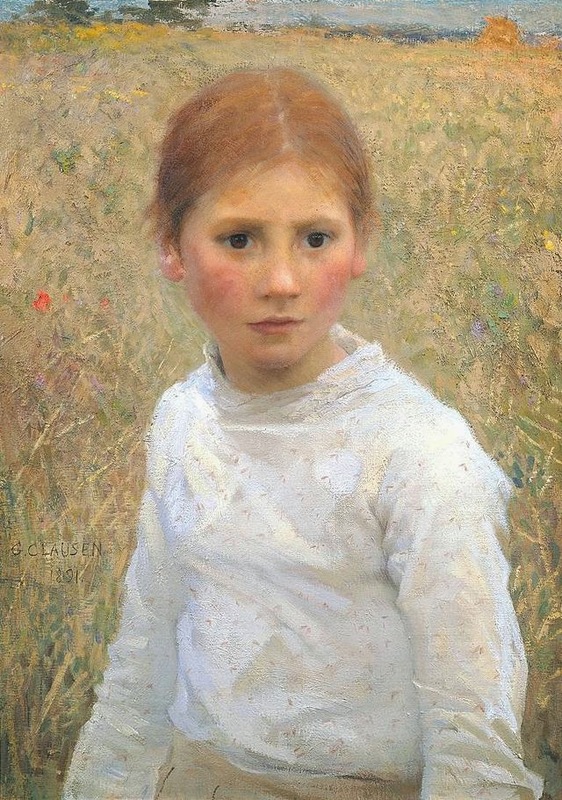 Just to clarify: Sir George Clausen RA was born in the UK. His father was a Danish craftsman, no doubt trained in the tradition that developed into Danish Design. His grandfather was a baker (marriage register). Thanks for your research, very interesting!